The President's Tweet Is Not A Game-Changer In U.S.-Pakistan Relations : Parallels The president's harsh message about Pakistan echoes one that U.S. administrations have been delivering to Pakistan for years, writes former Obama administration official Shamila N. Chaudhary. 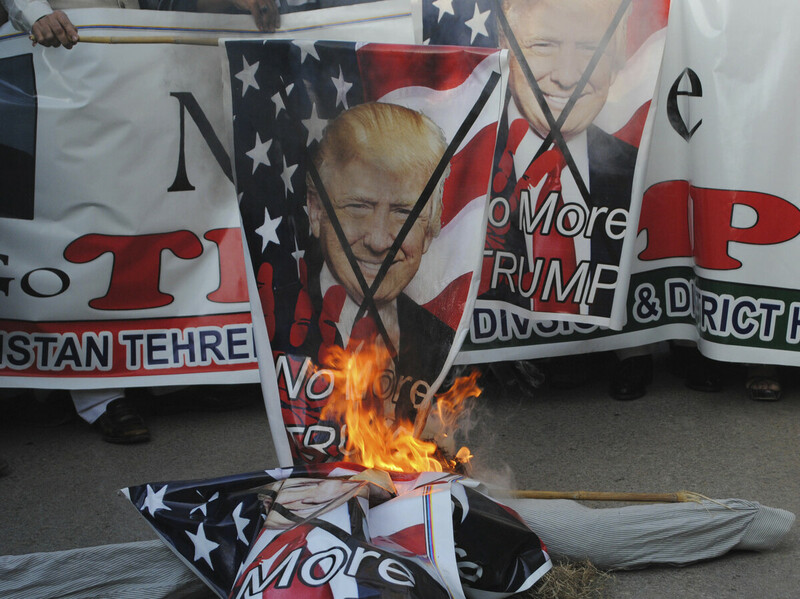 Protesters in Hyderabad, Pakistan, burn banners showing President Trump on Tuesday. Trump slammed Pakistan for "lies & deceit" in a New Year's Day tweet that said Islamabad had played U.S. leaders for "fools." Remember that time when President-elect Donald Trump called Pakistani Prime Minister Nawaz Sharif in 2016 and said: "I am ready and willing to play any role that you want me to play to address and find solutions to the outstanding problems"? This doesn't sound like the earnest attempt at diplomacy that Trump alluded to in 2016. But it's not as provocative as some may believe. Trump's take on Pakistan is neither new nor a game-changer. First, it is truthful. Second, it is a message that U.S. administrations have been delivering to Pakistan for years. The unsettling aspect is that a U.S. president has stated this in the most public and undiplomatic way possible, and he gives Pakistan no credit for past cooperation. After the U.S. war effort in Afghanistan began in 2001, several field reports suggested Pakistan provided tactical support to Afghan Taliban fighters and allowed sanctuary for the Afghan Taliban leadership in Quetta, Pakistan. While Pakistan never confirmed these reports, and in some cases denied them, they are widely believed to be accurate, despite some debate over the extent of Pakistan's influence on the Taliban. Trump's public threat was taken seriously in the Pakistani capital, Islamabad, where the government summoned U.S. Ambassador David Hale on Tuesday to convey its disappointment. Meanwhile, officials rejoiced in Afghanistan and India, where governments view Pakistan's duplicity with militant groups as a threat. But a look at the bigger picture shows that both Pakistan's worries and the sentiments of its neighbors are misplaced. The president's tweet is consistent with his administration's policy, which states: "Pakistan has ... sheltered the same organizations that try every single day to kill our people. We have been paying Pakistan billions and billions of dollars at the same time they are housing the very terrorists that we are fighting. But that will have to change, and that will change immediately." And Trump is not the first U.S. official to publicly admonish Pakistan. Numerous public incidents of rhetorical aggression occurred between the two countries in the past decade, most notably in 2011, after the unilateral U.S. raid that killed Osama bin Laden in Pakistan. At that time, White House counterterrorism adviser John Brennan publicly questioned how much Pakistani authorities knew of bin Laden's whereabouts. On the issue of assistance, previous U.S. administrations have also acted on threats to cut aid to pursue a course correction in relations with Pakistan. After providing major financial support to Pakistan's government starting in 2001, the George W. Bush administration cut aid by 13 percent in 2008. The move occurred amid rising U.S. sentiment that Pakistan was not meeting its counterterrorism expectations. In 2009, the Obama administration increased nonmilitary aid and continued military reimbursements, leading to unprecedented levels of assistance — reaching over $2 billion in 2011. But after the bin Laden raid that year, total assistance decreased by 64 percent. Since then, the United States has continued to push for greater accountability of Pakistan's actions in Afghanistan. Trump merely started where his predecessor left off. Working with nuclear-armed Pakistan is critical to U.S. national security. But Trump must manage the push from Capitol Hill, India and Afghanistan to punish Pakistan with sanctions and designate it a state sponsor of terrorism. As it plans to announce new actions on Pakistan very soon, the Trump administration should consider measures that go beyond previous attempts to change Pakistani behavior. In fact, changing Pakistan's behavior may not be the appropriate goal to pursue. It's time to ask a new question: How do we deal with a country that has areas of conflicting interests with our own, but one that demands our long-term attention? Ever since the Soviet invasion of Afghanistan in 1979, the United States has lacked a vision of long-term engagement with Pakistan, instead focusing on the short-term tactical outcomes it can gain from working with the country on security issues. Imposing new sanctions would decapitate any future discussion with Pakistan on counterterrorism or reconciliation in Afghanistan. They would create another barrier to access and dialogue on a number of more urgent national security issues and would not result in any change in Pakistan's relationship with militant groups of interest to the United States. Furthermore, a large-scale paring down or elimination of assistance to Pakistan would do away with a key tool and lever for American policymakers when bilateral relations are extremely weak — and when other countries, like China and Russia, are simultaneously increasing engagement with Pakistan. To move forward, the United States needs to look no further than the example of these and others among Pakistan's neighbors and partners. Among themselves, Saudi Arabia, India, Afghanistan, China, Russia, Iran and Pakistan have multiple policy conflicts. Yet they have managed to build ports together, pursue natural resource development, hold joint military exercises and even cooperate on occasion against terrorism. Of course, playing geopolitics comes with a price tag, and Washington has to be willing to play the game as others are. Beijing currently leads the charge with its China-Pakistan Economic Corridor initiative, valued at $62 billion. This dwarfs the 2009 Enhanced Partnership with Pakistan Act passed by the Obama administration, which intended to provide $7.5 billion in nonmilitary assistance to Pakistan over five years. Admittedly, the regional environment allows limited space for a refocused and more pragmatic vision of Pakistan, especially given U.S. involvement in Afghanistan and the growth of U.S.-India ties. Instead, such dynamics reinforce the need for the United States to push Pakistan to do more on militancy. But if Trump wants to truly distinguish himself, it's worth his time to create his own policy vision on Pakistan that goes beyond security, allows for conflict resolution despite differences, finds a way to work with Pakistan despite the challenges and protects U.S. regional interests. No other president has succeeded in this. But one thing is clear: It won't be accomplished by a tweet.